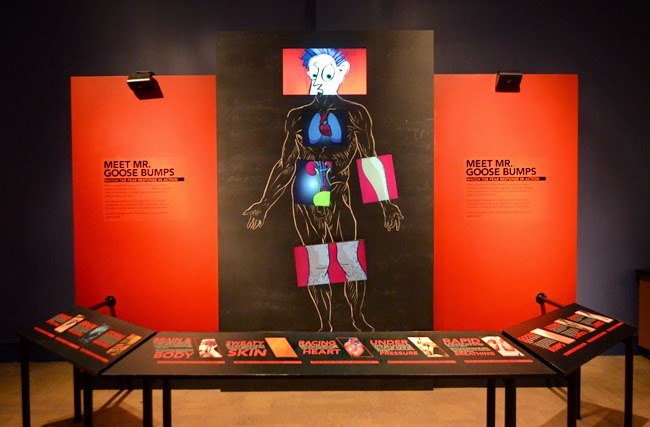 Run to Fernbank Museum of Natural History to see Goose Bumps! The Science of Fear before it disappears. C'mon...don't be afraid to have a little fun this week. It's not scary in the "traditional" sense...you'll actually learn a lot and have a giggle or two, but there might be some adrenaline involved. And don't actually "run"...I totally just meant to "hurry" so you don't miss this awesome exhibition! You've got one week left. Go! Or...finish reading this post, and then go. When Fernbank says this exhibition is "So much fun, it's scary! ", they're not kidding around. It's also highly informative—I learned a lot about fear that I didn't know before (how scary is that?! )—and there's fun throughout! 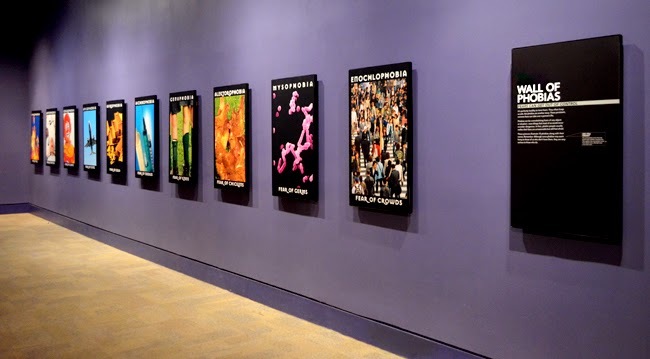 The exhibition leads with a Wall of Phobias...and a brilliant one at that. It's quite eye opening. I knew there were a LOT of phobias out there, but I had no idea that the range was quite so broad! Ever heard of alektorphobia? Or aurophobia? Count yourself lucky if you don't live with either of these...life would be quite a different thing, for most. Visitors, soon after entering the exhibition, are introduced to Mr. Goose Bumps. That's him in the photo above. He's the host of Fear Lab, which demonstrates how the brain and body work together with regard to fear response. 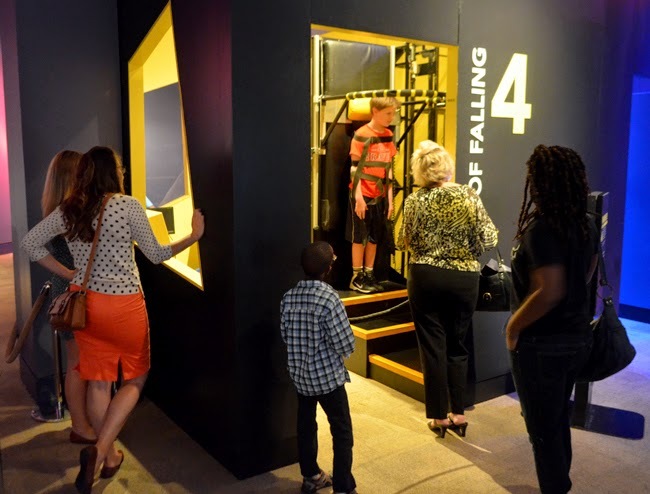 Brilliantly presented, in the form of video and hands-on activities, Fear Lab just might shed some light on just how many times fear has actually saved your life! It’s a natural response, but sometimes it can be a hindrance. 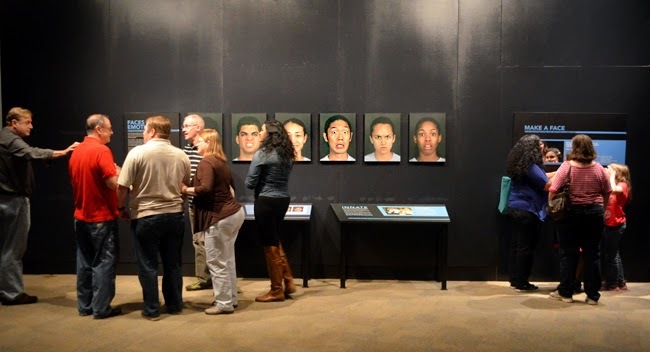 This exhibition helps us understand fear in a more logical sense. 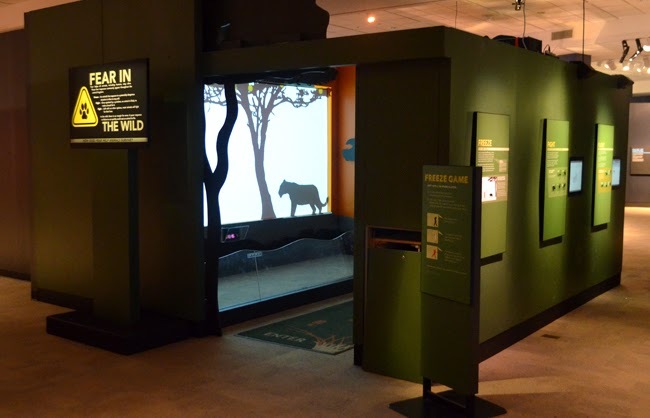 Fear in the Wild is an interactive demonstration of how fear helps animals survive in the wild. Visitors walk into the room where they'll see their own silhouettes projected on the screen...soon to interact with a creature from the wild. It's fun to do...and fun to watch! The Challenge Course is comprised of interactive experiences that focus on four of the more common fears—Fear of Animals, Fear of Electric Shock, Fear of Loud Noises and Fear of Falling. I was quite surprised by my own reaction to these. I've been skydiving, I've gone snorkeling eight miles off the beach, I love roller coasters...I thought I had a pretty strong resolution when it came to "being afraid". Turns out, I was something of a scaredy-cat when it came to receiving an electric shock. I knew full well that it was perfectly safe. Fernbank is extremely mindful of visitor safety. But still...I wasn't going to let myself be shocked! That was a shocking revelation, actually. The Fear of Falling is by far the most popular experience on The Challenge Course. You get strapped in and then you fall! Yes...you fall! Backwards. That's another one that's fun to observe. If you're with a group and it's crowded or you don't have an optimal line-of-sight, step around to the back of the booth where there's video of the fall. Are you afraid of falling? The Faces of Emotion display is awesome. It shares how we share our feelings with others, including fear and fright, through facial expression. I know it's a serious topic, but some of these are pretty funny! 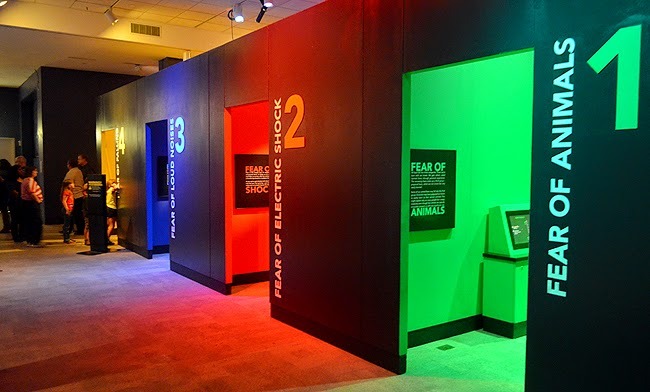 There's a lot more to this exhibit than I'll cover here, but be on the lookout for Fear Theatre, What are the odds?, the display behind The Challenge Course, brain comparisons, and measuring your own fear response. Just keep an eye out...there's lots to see and do! I was glad to see the inclusion of popular culture that for some—in some cases many—can cause great fear. It was a reminder that not everyone copes the same. 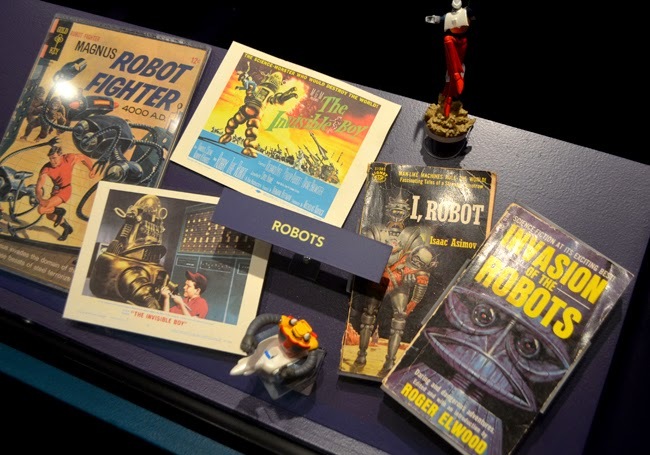 I for one love robots and enjoy the humor of clowns. Other people...not so much. But those same people may have been brave enough to experience the Fear of Electric Shock back on The Challenge Course. 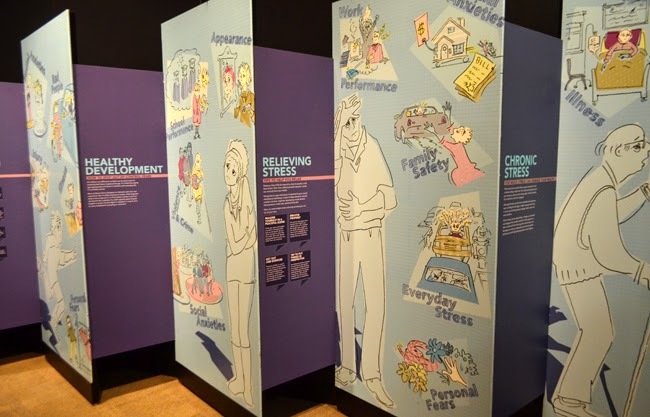 I was even more glad to see the Museum include a section on coping with fear and how it affects people, throughout their lives. When you visit, even if you're running short on time, please take at least a few moments to explore this section of the exhibition. Fernbank artist John Trotter did a magnificent job on the Goose Bumps! gift shop…it’s one of the best I've ever seen! And Crystal Garner did a marvelous job of purchasing for the gift shop. And, yes, I made a zombie-related purchase myself! John told me, "It's a very collaborative process that we've developed making these stores. This one in particular was a LOT of fun to put together. 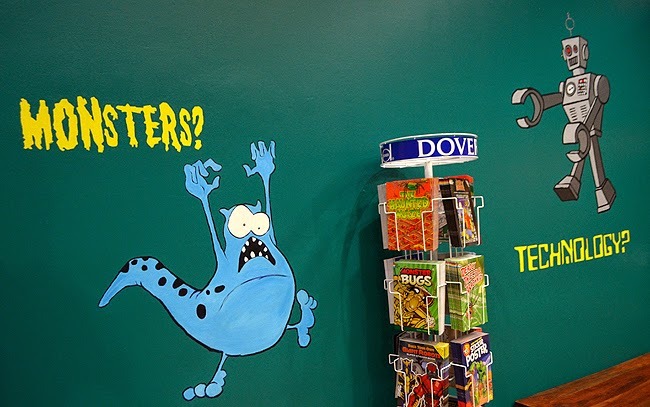 How often do you get to paint little monsters and zombies on the walls at work and not get in trouble?" I was also reminded that proceeds from the gift shop go directly to the funding of educational programs, so shop to your heart’s content! 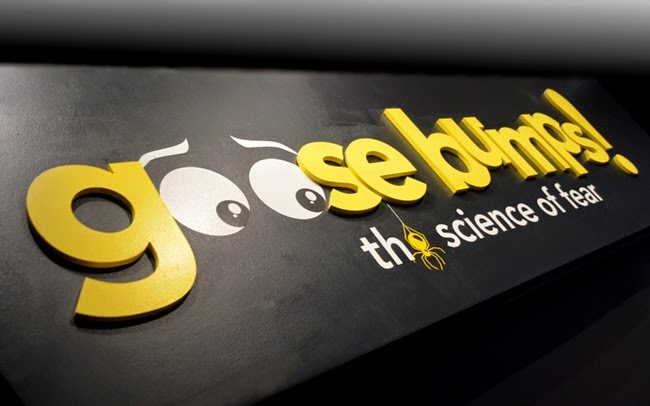 Now...get yourself over to Fernbank Museum of Natural History to see Goose Bumps! The Science of Fear, and get there by Sunday, January 4. It'll be the most fun scare you've had all year!